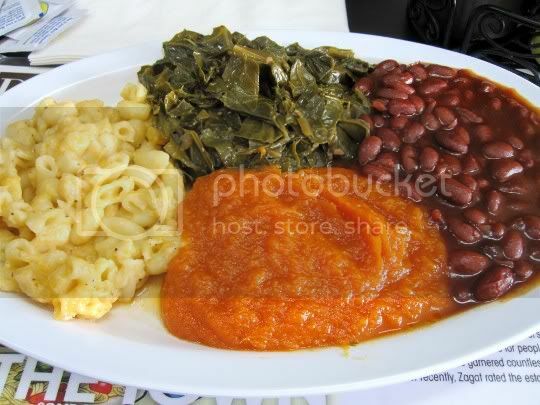 Imagine finding a barbecue restaurant that prides itself in completely vegetarian sides. A menu that clearly states, "All of our vegetables are cooked without meat but you'd never know it." Crazy, right? 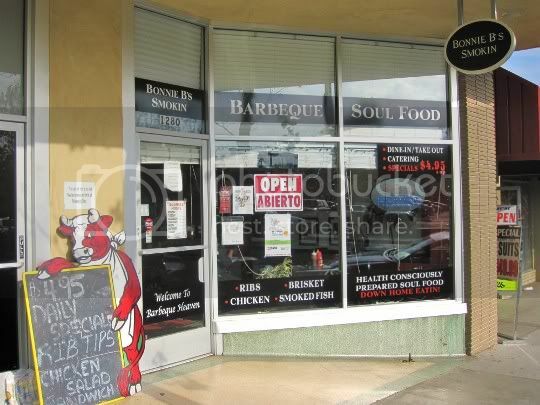 Well Bonnie B's Smokin Barbeque Heaven does just that, and the food is unquestionably delicious without skimping on flavor in any way. The small Pasadena restaurant is a bit hard to miss, as it almost resembles an office from the outside. Inside, there's only about seven tables. but that doesn't stop a line of people from constantly streaming in and out to eat. The room is decorated in red, black, and white, with framed pictures hung everywhere and a huge country western mural painted on the wall. 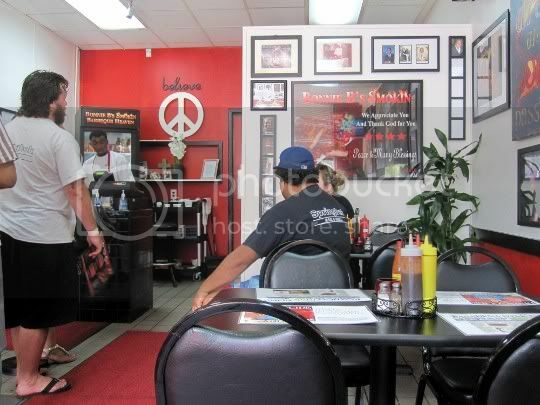 The vibe is friendly and family-oriented, with the nicest, most helpful staff. I tried to get a little more specifics on the side dishes, wondering if any of them were vegan. While I'd imagine at least the greens, black eyed peas, and okra would be vegan, one of the women working there told me they may or may not use butter in some of the dishes. Still, she assured me that all of the sides are definitely vegetarian. The prices seem a bit steep, but I guarantee you, it's worth every penny. You can get individual sides ($1.99 small, $4.50 medium, or $8.50 large), or two versions of the Vegetable Plate ($7.95 for three sides, or $9.95 for four sides and a corn muffin). I opted for the four-side plate, aka the "Big Deal." I thought the portion sizes could have been a bit bigger, as I cleaned off my entire plate in no time. I was either extra hungry, or the food is that amazing (I'm gonna go with both!). Smoky, tangy, bitter, and garlicky, just how a good pot o' greens should be. You can tell there's definitely no meat in here. I'm always amazed when I come across people who know how to cook greens without the addition of necks and hocks and all that other nonsense. As if meat is the only way to add flavor to something...please! Bonnie B's flavors these perfectly, and they're also cooked to just the right bite. Another dish with clearly no meat additions, these beans are super sweet and smoky. They're super sweet in that good savory way: you keep shoveling them in your mouth like you're eating candy! The thin, syrupy sauce is so amazing: try sopping up each of your sides with it, delicious! These aren't your traditional candied yams; as you can see, this is more of a sweet potato puree. But it's thick, smooth, and super sweet. I'd almost go so far as to say there isn't any butter in these, and they actually taste healthy! The flavor isn't rich and decadent, but light and almost fruity. While I do think this was just slightly bland compared to the other sides, I'd still want to order up a second helping. But this is definitely soul food mac and cheese: peppery, garlicky, and cheesy. It's thick and creamy, with a heavy sharp cheddar flavor. Although Bonnie B's is a bit of a drive from my home, I'd definitely make the trip just to come back here. Perhaps stocking up on the individual sides is the best option. Yes, the food is that good!